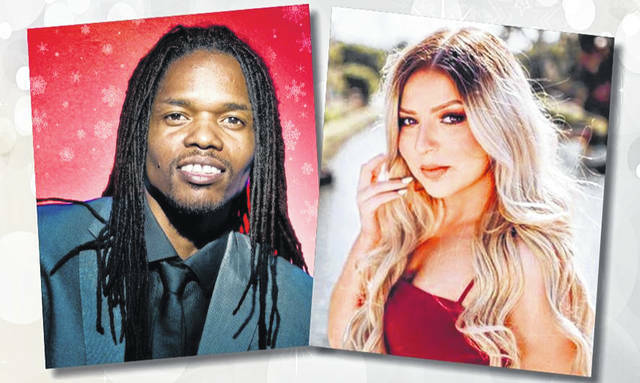 America’s Got Talent Holiday Tour of Champions comes to Point Pleasant High School Auditorium Thursday, Dec. 20 starring Landau Eugene Murphy Jr. and special guest, AGT season one winner Bianca Ryan, both pictured. The concert is a fundraiser for the Point Pleasant River Museum and Learning Center’s building fund. POINT PLEASANT — Landau Eugene Murphy Jr., West Virginia-native and the 2011 winner of NBC TV’s America’s Got Talent, will perform at the Point Pleasant High School Auditorium Thursday night, Dec. 20 at 7 p.m. The concert is a benefit fundraiser for the Point Pleasant River Museum and Learning Center rebuilding fund. The museum suffered a devastating fire earlier this year. Murphy is the soul and Sinatra-singing season six winner of NBC TV’s “America’s Got Talent.” The former car washer’s Columbia Records debut album produced by Grammy winner Steve Tyrell spent six weeks at #1 on the Billboard Jazz chart. Landau’s follow-up holiday CD “Christmas Made For Two” raised thousands for the Children’s Home Society of West Virginia and received nationwide airplay including Sirius/XM’s “Holly” channel. As part of the America’s Got Talent Holiday Tour of Champions Landau will be joined for the first time on stage by America’s Got Talent Season One Winner Bianca Ryan. By the age of 11, Bianca had already made history as the very first winner of America’s Got Talent while also releasing her major label debut and earning public praise from the likes of Quincy Jones and Simon Cowell who described her as “potentially one of the best singers I have ever heard in my life.” In between constant touring, the Philadelphia-based singer and songwriter recorded the fan favorite True Meaning of Christmas EP in 2009 with producer Anthony Marinelli [Michael Jackson, Lionel Richie] and the Christmas Everyday EP which features “Why Couldn’t It Be Christmas Everyday?” that has over 2.26 million Spotify streams and has been added to compilations alongside Justin Bieber and Kelly Clarkson. Event tickets are $35 and can be purchased by visiting www.landaumurphyjr.com or by calling the river museum at 304-674-0144 or call 703-268-4218.